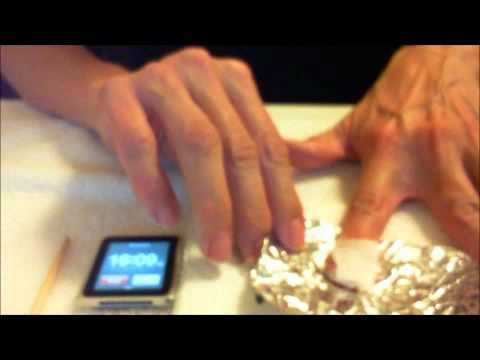 I've shown many people how to polish a nail so that they do not get the polish on the cuticle. I even describe in in my book "The Secret to Beautiful Natural Nails". I describe it as a 4 Stroke Method, until now! I love this easy visual from The Polished Perfectionist. The reason I love it so much is it shows the initial polish brush placement on the nail. 2. Push the fanned out polish brush slowly toward the cuticle making certain to leave a "hairline" area bare between the cuticle and the polish. 3. Pull the polish brush to the tip of the finger. 6. Polish the very tip of the nail where you would file it. Don't forget when you are polishing your nails it is important to use a base coat (it holds the color to the nail and prevents chipping and peeling), your color (usually 2 coats) and a top coat (for shine and increased durability). If you get a little polish on your skin, have an manicure stick handy. 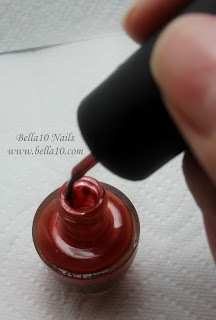 Apply your top coat and apply a small amount of the top coat to your skin where the color is. Wipe off the topcoat and color polish from your skin, avoiding the nail itself. No polish remover necessary if you are dealing with a small area. To help with drying, apply a cuticle oil, like CutiOil, to the cuticle area of your nails (don't be afraid to be generous) and have a cup of ice handy. The cold cup of ice chills your fingertip as you hold the cup and sets your polish up faster. It usually take 15 minutes for your polish to set up enough not to smudge and about an hour for it to not dent. "8 Tips on How to Grow your Nails Faster and Stronger"
She told me that one of the first things she noticed was that the technician brought out the implements and they were in a sealed bag. 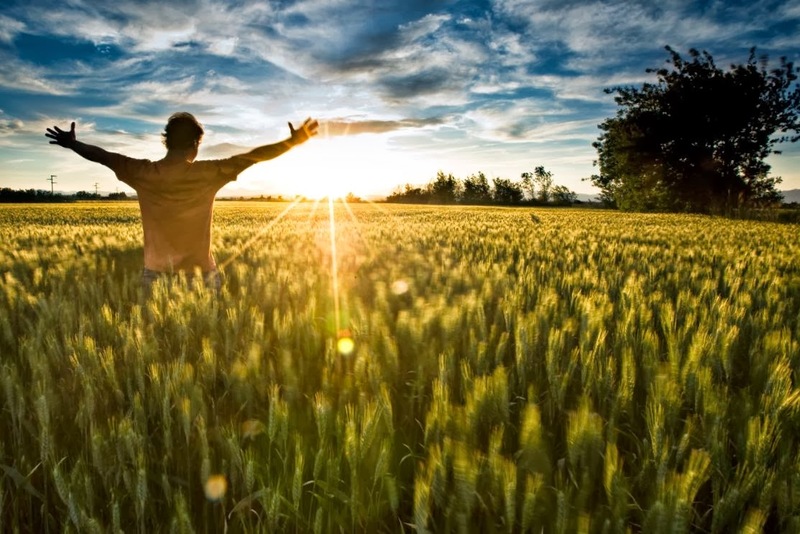 She said that she thought, "This is a good sign". But then she noticed that they used some of the same implements between herself and her son. She then started to notice more! She didn't see anyone clean the foot bath before they sat down for the pedicure and didn't see any of the foot baths being cleaned in between the other clients. That's when she started praying "please don't cut me, please don't break my skin"! The part that shocked her the most was after the pedicure, she saw the technician rinse the pedicure implements in cold, and she emphasized it wasn't hot, water, dry off the implements in a towel then put the implements back into the bag and resealed the bag. Ugh! They hadn't even been sanitized! And they were probably like that before they were used on her! In a salon, implements need to be sanitized for a minimum of 10 minutes in disinfectant that kills bacteria, viruses, fungus and tuberculosis. Pedicure foot baths must be cleaned out and sanitized with the same type of disinfectant between every client! There are many different products that can be used to disinfect properly. Some of them are Barbicide, Ultracare, Cavicide and Citrus II Germicidal Cleaner (all are registered trademark). Who wouldn't want a quality manicure set? This one is Awesome!!! Here is where I would suggest that more people should start bringing their own implements unless you know for a fact that the salon and technician are cleaning and sanitizing regularly between clients. I have found a few manicure sets through a company called Zamberg. 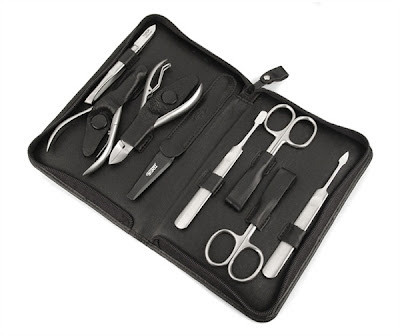 They have high quality manicure and pedicure implements along with complete manicure sets that will last you a lifetime compared to the cheap tools you find elsewhere. The nice thing is that you can sanitize your own implements with something as simple as alcohol. We all have that favorite bottle of nail polish... You know the one. In Part 1, you learned how to revive and thin out your old polish. You could try to do that again but you've already thinned it two or three times. If you thin it one more time, it'll start chipping sooner. In Part 2, you found out how to keep your nail polish from getting thick too soon, just by keeping the neck and cap clean. So now what? It's such a waste when only get a half of the color out of the bottle before you have to throw it away. There is an answer. If you have a specific nail polish color that you really like, you should buy two bottles of the polish color. Use one of them to polish your nails. Use the second bottle to refill and refresh the first bottle! Clean the neck and the cap of the bottle you use to polish with. Use your "refill" bottle to fill up your "polishing" bottle. with some fresh base coat of the same brand. Remember to keep the necks of all the bottles free of any spilled polish. to mix the fresh polish in with the older polish. If you plan to use it right away, you should let all the bubbles inside settle first. so you can use it again when you need it. This way, you get one and a half bottles of the polish color out of the two bottles instead of only getting half of the color out of each bottle. Keep all your polishes fresh this way. I even keep a large bottle of base coat to refill the bottle I use regularly. 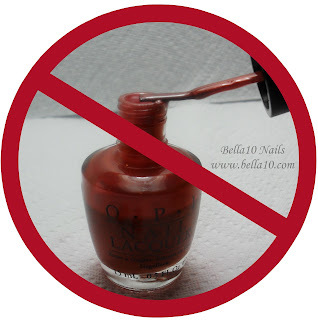 Using this technique, you won't degrade the integrity of the nail polish and it will be less likely to chip later as it wears on the nail. I hope you've enjoyed the Nail Polish Series. Send me a message if there is a topic about Natural Nails, Nail Care or Nail Polish that you would like some insight into. I'm happy to share my knowledge and experience! We all have that favorite bottle of nail polish in our private collections that we absolutely love but it’s beyond saving. We can’t open the bottle, and if we can, it’s a goopy mess and our heart breaks when we hear it go “thud” in the garbage can. How could we have let our favorite color get so bad. It’s all in how you wipe the excess nail polish from the brush before applying it to your nail. This is not the proper way to wipe off excess nail polish. 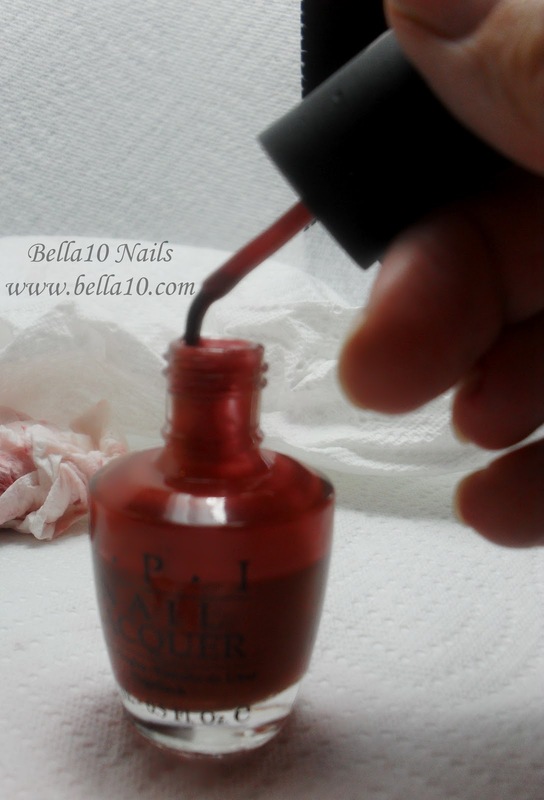 This will definitely allow the nail polish to build up around the neck of the bottle very fast. If you insist on doing it this way, be prepared to wipe off the neck of the bottle every time you polish, before you tighten the lid, to prevent it from getting into the cap. is to wipe off the nail polish this way. You may need to clean this up every few times you use the polish because it you may still get a little polish on the neck of the bottle. The nice part is that it won’t be as often and all your excess polish goes back inside the bottle instead of on the neck and inside the cap. Working as a nail technician, you learn quickly that you need to maintain your nail polish collection for optimum use and to save $Money$! 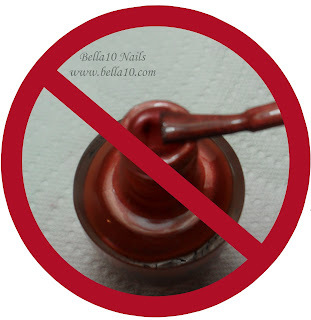 Today I'm going to show you how to reclaim an old, and probably favorite, bottle of nail polish. We all have something like this lying around. When you shake it, you can barely hear the metal blending beads. And trying to open it is nearly impossible. I'm not saying every bottle of nail polish can be saved, especially if it is too far gone. Once some of them have been saved, they still may not last as long as you want and eventually you will have to purchase a new bottle. We’ll cover “Getting the Most Out of Your Nail Polish” in Part 3. It's pretty thick and I can barely hear the blending beads. Polish Thinner and a Base Coat Nail Polish. If you cannot open the bottle, one of the best methods I've found is to put polish remover inside the lid of the polish bottle. Turn the bottle up-side-down and slowly drip polish remover down the side of the bottle, so that it runs down the side and fills the cap with remover. Let it sit this way for about 10-15 minutes. I found that this works better than hot water poured on the cap. But keep that method in mind if this doesn't work easily. Let’s just hope we don’t need a pair of pliers to grab a hold of the lid. Do not use the pliers on the glass part of the bottle! try to apply the nail polish, it goes on "goop-ey". Look at all the nail polish on the neck of the bottle and inside the cap. This is what was gluing your bottle shut. We'll need to clean this up first. This will aid you with cleaning it easily. Then fill the cap with polish remover and let it soak and soften. Clean the neck of the bottle. like you are tightening the cap onto the paper towel. out from the inside of the cap. Now it’s time to thin the polish and make it work-able. and a base coat nail polish. I only have a Jessica base coat for this demonstration. Add enough polish thinner so that the blending beads move freely. *Note* Do not use polish remover as your thinner. the nail polish qualities become compromised. chip faster than it ever did before. to the nail and minimize the risk of chipping polish. Replace the brush stem and the cap and tighten the cap on to the bottle. with less streaking and last you a little bit longer overall. I hope you learned something from this tutorial.